Yes, we are busy inside the house tearing out old stuff and planning, re-planning, and re-planning again our big changes. But we did take a Saturday break to get some must-haves in the ground. Ben found three-year-old blueberry bushes on Craig’s List. We situated them toward the back of the open two acres, just outside the wooded area. 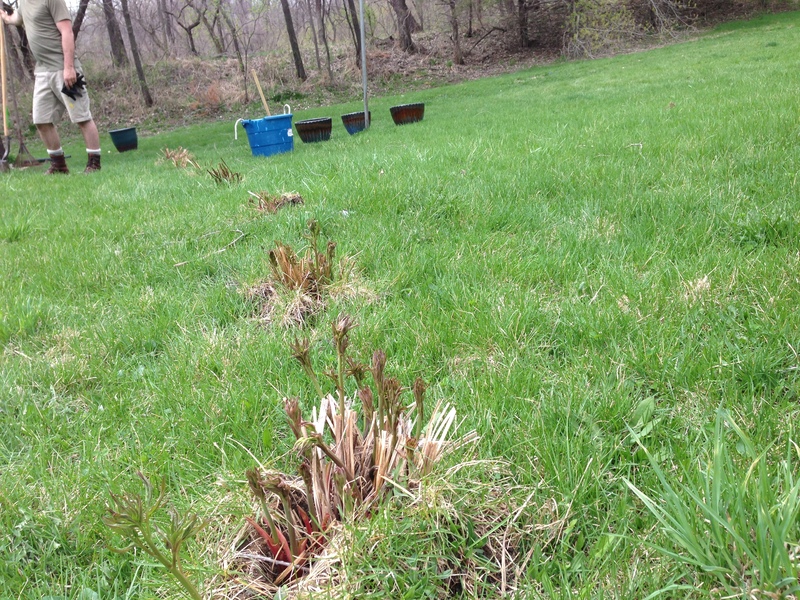 We also transplanted some raspberries from the spreading-like-crazy plot at our house in town. 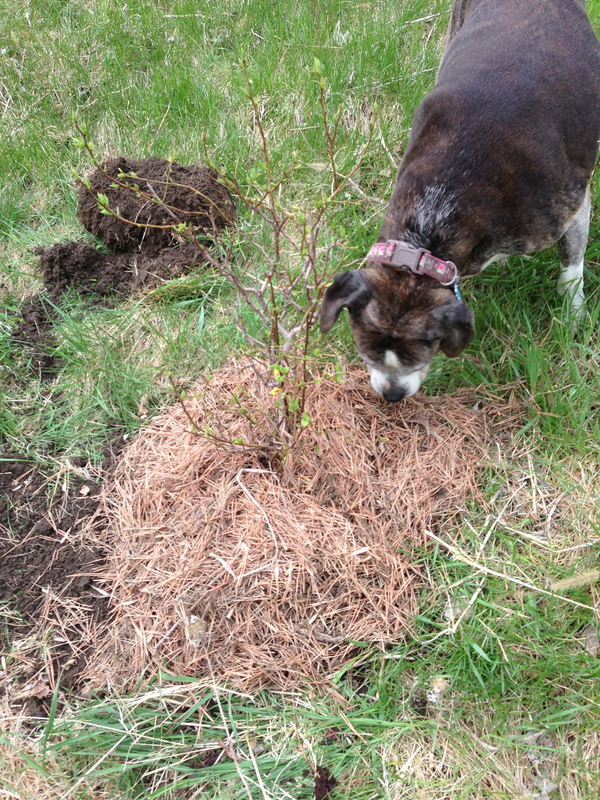 Sadie checks our work on the blueberry bushes. Ben also planted some veggies, mostly squashes, in a terraced bed he created in the berm. 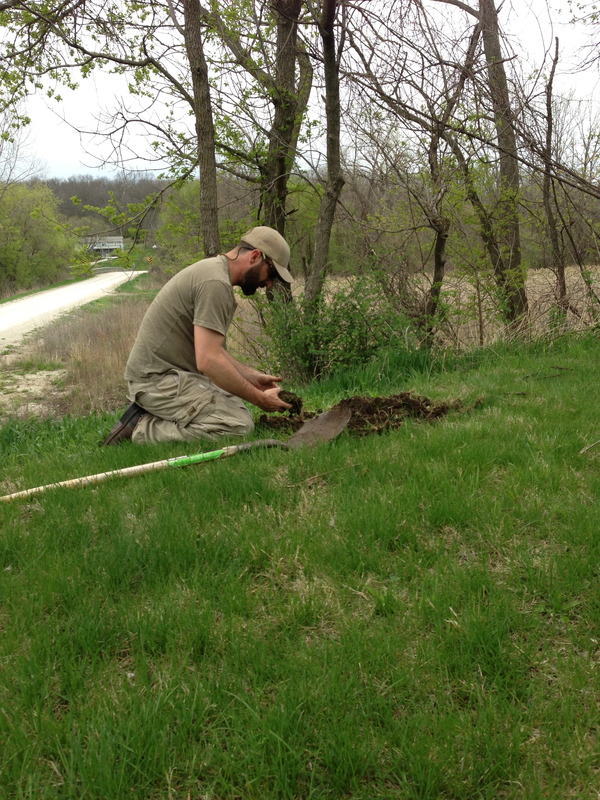 We planted watermelon and cantaloupe in a place where we hope they will spread out from the edge of the front yard down and spill toward the road. A couple of months ago, Ben surprised me with this bouquet, below. We finally got some of the seeds planted. Hopefully, we’ll soon have a flower patch, a climbing vine with blooms, and a row where three types of sunflowers mix together. We divided peonies and created a row that eventually mark the front of the greenhouse. I’m excited that they survived the spring move just as they were starting to sprout! I’ll be thrilled if we get blooms this year—at this point I’m just trying to keep them alive!